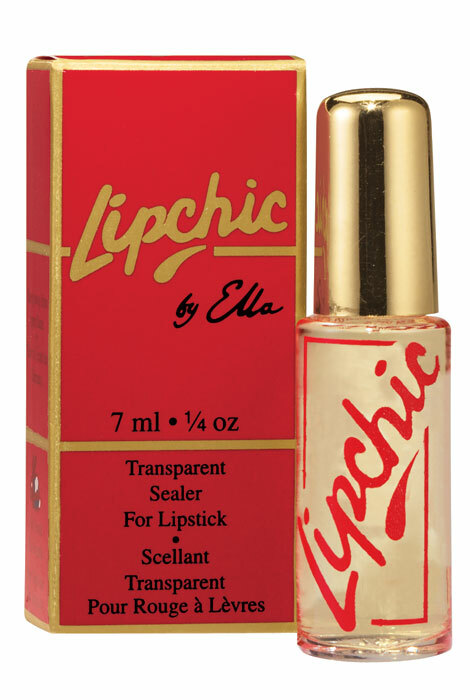 Lipchic lipstick sealer is Europe's #1 selling lipstick sealer for over 60 years. Lipchic's clear, 100% botanical formula turns your own lipstick into smudge-proof, kiss-proof, perfect-looking lip color that lasts all day. Stops bleeding and feathering, too! Lipchic sealer is easily removed with soap and water or any makeup remover. Contains no ink, dye or chemicals. 0.25 oz. Apply min.4/max.8 full brush fulls. Add more for longer wear - up to 24 hrs. Kiss hand after dry to self-test if lipstick transfers, add more Sealer. I am a 73 year young woman. Lip Chic is one product I can't live without. It really works. Stops your lipstick from bleeding. I've been using this product for years. A must have. I found this product in a store years ago and took a chance on it. Lipchic really makes your lipstick last for hours. Even through a light meal! I have not found a product that works better. The only negative is that there is a burning or tingling sensation when first applied. It goes away in seconds but might surprise you the first time you use the product. I have used many lipstick sealers and this is the best one on the market. It does what it says it will do.....keeps your lipstick, any lipstick on all day. Use it correctly and everyone will have the same results.....fabulous lips!!! Thank you Lipchic for such a great product. Best there is in the market! It is the best anyone can find in the market. It does exactly as it says as long as it is applied correctly. Have not seen anything better than Lipchic in the market yet. For most who say this product does not work, you most likely are not using lipstick correctly or following the directions this comes with. ALL lipsticks should be blotted after application. If you have too much lip product on on the first place, it won't work. It also takes more than one coat of this stuff to keep your lip products from transferring, the directions say 4 coats. I use 2, or sometimes 3 if I am using a rather slick lip product. I've tried about every one on the market and this one works the best. It does not work as well as I remember it working years ago. I waited a few days to write this to make sure I have used the lipstick sealer enough to offer an opinion. I like it but I need to learn to work with it.We/I wear so much lipgloss now and this product performs better with lipstick. I am not giving up on it. I am ready for lipstick anyway! I do not care for this product. First and most importsnt to me is it does not work. I used my lipstick and then the lipchic according to the directions and within 1/2 an hour my lipstick was gone and I did not eat anything. I would return it but it would not be worth the cost of shipping back. I was really looking forward to getting this product. I at first used it with the Set of 6 Creamy Neutrals. Lipstick did not stay on. Used it with other lipsticks, made no difference. Lipstick comes off just as if no product were used. Tried this product before. It didn't work then but I thought I'd try it again but no better! Can't keep my lipstick on! extends wear of lipstick; saves time and money because I don't have to keep reapplying my lipstick. I used it before. I like it. Looking for a product that will give my lipstick staying power. I have a problem with lipstick bleeding and not having the long lasting lipsticks actually last and decided to try this product to see if it would stop that. 1 NEED TO KEEP MY LIPSTICK FROM FADING. to help maintain my lip color in place. I want my lipstick to last for hours. I used to use an English Ideas sealer that was great. Now I am trying your product. Cause I have so many lipsticks that fade. hope it really works without drying my lips out. I lick my lips often and I needed something to help my lipstick stay on. I am always reapplying my lipstick. Want to see if this is as good as the ad. I like my lipstick to stay put for as long as it will. I am trying for the first time. I have used this many times, and it keeps lipstick on for hours. Lipchic was featured on the Today show with high remarks. Willing to give it a try! This is second order of product---absolutely love it and just lost it somehow! So no hesitation to reorder. It works very well for me and I have recommended it to my friends. I really this product and have had success with it! I have used this product before with excellent results. I made this purchase for my son's fiancÃ©. I thought it would be handy to use at the wedding so her makeup stays fresh for the pictures and ceremony and after party. It works! Can no longer get it at my beauty supply store. to hold lipstick for several hours. I have many lipsticks I would like to use from my collection, but because I now prefer the long-lasting (5+ hours) type, I have let them languish in a drawer. I want to use them!